Welcome to the first of twelve checklists of the top five financial to-do’s each month. I will be running this series throughout 2012, and each list will provide you with an article on financial maintenance tips relevant to that month. 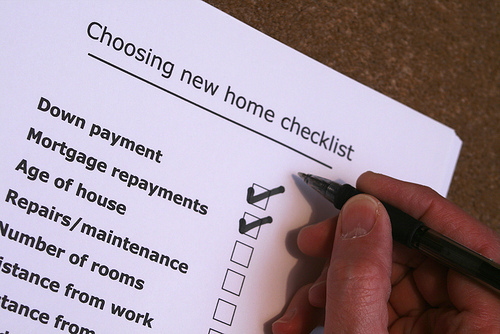 From tax planning to home maintenance you will be able to follow along so you can keep your financial house in order! Even though January is only the first month into the year, the steps taken can be vital for your financial upkeep for the entire year. Your financial health begins with a budget, so make this your first New Year’s Resolution! There are online budgeting tools like Mint and Yodlee (and I am sure many more) that will basically walk you through setting one up step-by-step. There are many personal finance blogs that will provide you with free Excel templates created for budgets. If all else fails and you want something personal created for your own financial needs, then I do offer a service creating a custom Excel template suited to your specific needs. All in all, you have too many options, both free and paid, available to you not to start a budget for the year. If you have a budget from last year, see where you fell short and work to it revise it to your current needs. Yes, the filing deadline is a long ways away! But that doesn’t mean that you can’t start gathering and organizing your paperwork now, and maybe even file early for a change….scary I know! Are you an independent contractor, or do your hire independent contractors (I do, and this is new for me), then this is the time to start processing your 1099 forms. Also, I’m telling you in this checklist to start a checklist…yes, another one. As your tax forms start coming in make sure you keep track and mark it down, it can be easy to forget until it’s time to start actually preparing your taxes. I have a hard time keeping up with all the forms; W-2’s, 1097, 1098, 1099 forms…well you get the point…there is one for every deduction out there. The most important part of tax preparation is figuring out who is going to prepare them. Some people need a CPA, and that is perfectly fine, just make sure you find a reputable one. For others, perhaps tax software is a cheaper and easier way for you to go. I use TurboTax every year, and I make sure I find the best online discount for it. Make sure you do some online searching for the best deal. Christmas may be done, but the memories of monies spent are still very near. This could actually be a good thing. I hope you are in a habit of paying with plastic (provided you have the money to pay it off) or you keep all of your receipts. Christmas spending is the single biggest budget break of the year. If you are one of these people that throw money and caution to the wind, then it’s time to change that. Tally up last months shopping and make sure you set aside money for it this year. Maybe that involves spending less, but right now you have 11 more months to sock away some extra cash in an account especially for this use. My credit union offers a special account just for holiday shopping, it has an attractive rate and no fees…see if your local credit union has something similar to offer. How much are you contributing to your 401K, if at all? Do you have a Roth or Traditional IRA? Now is the time to start using these accounts to your financial advantage. You could be paying uncessary taxes for failure to pay yourself first. If your employer offers a matching contribution to your 401k then make sure you contribute enough to take full advantage. Any extra money after that should be allocated to some type of IRA. I have another article on the site that will give you my recommended strategy, but quite honestly, any method of saving extra money isn’t going to hurt you at all! Sure this sounds generic, but it’s more important than you may realize. Do you have a good filing system? Is your paperwork located in place? Are your drawers a mess? Quite honestly, all of the above suggestions are impossible without the proper organization. How can you maximize your tax deductions unless you have all the necessary paperwork and receipts to know them all. If you can’t track your monthly spending, then you can’t create an effective budget. Without an effective budget then you won’t know how much money you can comfortably put into retirement accounts. You get the point. If you are disorganized, take the first part of this month and change that. Create files, buy a cheap cabinet, or use existing space more efficiently. Make sure you come back in February for the next to-do list, there is more to do next month than you may think!